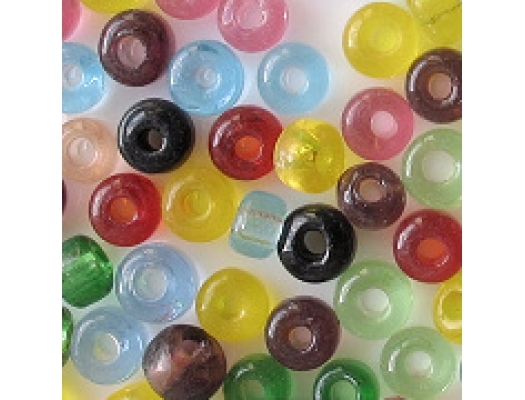 Most beads are 4mm thick and 5mm wide, but some are smaller or larger; these beads are more tire-shaped than they are rondels -- similar to seed beads. 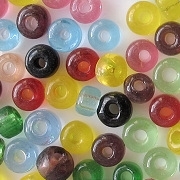 A variety of colors: light blue, light pink, light fuchsia, light green, green, amethyst purple, black, yellow, red. These are Indian beads, so they aren't a uniform size and some of them have minor surface defects. I'm not very impressed by these beads; there's really nothing special about them. They looked better in the supplier's picture. 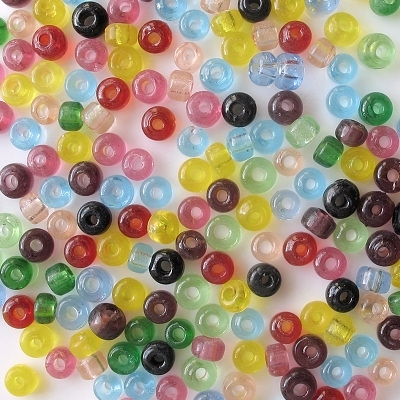 When I bought them, I didn't realize they were more like seed beads (which are not molded) than pony beads (which are molded).